The Manaslu circuit is a very picturesque circuit with beautiful waterfalls. It's fast becoming the new Annapurna. Begin the trek from the historic centre of Gorkha after a 6-7 hr drive from Kathmandu. 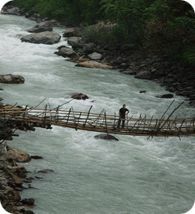 The trail heads up the valley of the Budhi Gandaki River through wild and unexplored country inhabited mainly by members of the Gurung ethnic group. The trail circumnavigate Manaslu the world's 8th heighest peak [8156m.] crossing Larkya pass at 5100 meter and finally emerges onto the Marshyangdi river valley along the main trail of Annapurna circuit. 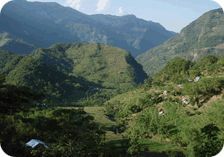 We'll be staying in the local tea houses and at times tents. They usually have a good selection of hot food and drink. However the washing facilities are basic and you may have to share a room with another member of the trekking group.